Bring the kids to your local LEGO Store this Tuesday for a free LEGO mini build. 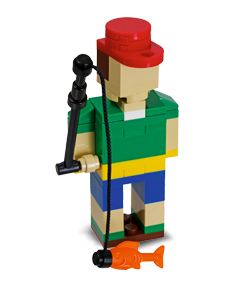 Stop by the LEGO Store at 5 p.m. on Tuesday, June 4, 2013, to build a LEGO fisherman. This would be an adorable gift from a child to a Dad who loves to fish! If you don’t have a LEGO store near you, or you can’t make the monthly mini-build, you can download the month’s LEGO mini-build instructions and build the model using LEGO bricks you have at home. You can also download past monthly LEGO mini build kit instructions for free.